This blog is a shortened form of the paper John presented at the conference, God of Wonder in September. Scientists and God in colonial New Zealand. ‘Extinguished theologians lie about the cradle of every science like the strangled snakes beside that of Hercules,’ thundered T.H. Huxley in an 1860 review defending Darwin’s Origin of Species against Anglican clerical critics. ‘History records,’ he continued, ‘that whenever science and orthodoxy have been fairly opposed, the latter has been forced to retire from the lists, bleeding if not annihilated, scotched if not slain.’ For the rest of the century, Darwin’s bulldog, who coined the term ‘agnostic’ and claimed that agnosticism was more intellectually respectable than theism or atheism, led a vocal group of professionalizing scientists in a campaign to wrest control of British science, education and culture from the Anglican Establishment. The Church of England had played a powerful role in English science since the seventeenth century, when Anglican men of science such as Francis Bacon, Robert Boyle, John Locke and Bishop Sprat forged an alliance between the new science, the national church and an expanding imperial state. Anglicans figured almost as prominently in establishing the British Association for the Advancement of Science in 1831 as in founding the Royal Society of London in 1660. All of the science professors under whom young Charles Darwin studied at Cambridge from 1828 were in holy orders. One, the Rev. John Stevens Henslow, professor of botany, nominated Darwin for the position of naturalist on HMS Beagle, a voyage that would make Darwin’s career. Although Hutton’s attacks on clerical critics sometimes echoed Huxley’s, he was no militant agnostic. The son of the Anglican rector of Spridlington, Hutton interpreted evolution theistically throughout his long and distinguished career. He saw the natural laws and processes at work in evolution as ‘worthily and incessantly subservient’ to God’s will. Men of science could reasonably believe ‘in the universal bowing of all nature hourly, daily, unceasingly to the unerring laws and sustaining power of God.’ Admiring ‘the beautiful perfection of our bodies’ and ‘the wonderful adaptations in the forms of animals to render them efficient for their purposes of life,’ Hutton saw evolution as a grander and more awe-inspiring method of creation than older notions. He disagreed with those who rejected evolution because it conflicted with a literal reading of the opening chapters of Genesis. Convinced that ‘the Word’ was ‘based on the sure foundations of truth,’ he argued that such passages should not be read literally. But he seldom discussed Scripture in detail because, untrained in theology, he felt ill-equipped to ‘deal properly’ with such issues. Four years after writing one of the first and most favourable reviews of the Origin published anywhere in the world, Hutton, now a captain in the British army, left for New Zealand. Exploring the development of his views on science and religion, this essay argues that Hutton’s theistic science was more mainstream than marginal in the colony’s scientific community before the First World War. I hope to illuminate why theistic science flourished better in this colony than in Britain, and to indicate, briefly, some of the racial and political consequences. Back, now, to Hutton. Arriving in Auckland in 1866, Hutton’s expertise in geology and mineralogy won him a job with the Auckland provincial government investigating coal deposits in the Waikato. From 1871, he spent two years working for the government Geological Survey under James Hector, investigating the geology of Thames and Great Barrier Island. Publishing catalogues of NZ birds, fish, mollusks and insects between 1871 and 1881, he worked as Otago provincial geologist from 1873, lectured in geology and zoology at the University of Otago, and became its first professor of natural science in 1877. Moving to Canterbury as professor of biology in 1880, he published over 100 scientific papers, often using evolution to explain the origins of New Zealand’s distinctive flora and fauna. In book reviews, public lectures, articles and books he continued to defend the theistic evolutionary views he had expressed in 1860-61. The quality of his scientific work was recognized by his election as fellow the Royal Society of London in 1892. Modern philosophers and some historians have sometimes argued that theistic worldviews such as Hutton’s were unacceptable in science because they prevented biologists from offering natural explanations of phenomena. In short, theistic belief was a science-stopper, an epistemic vice. How well does the historical evidence sustain such claims? There is no evidence in any of Hutton’s scientific papers that he invoked God as a cause or explanation of natural phenomena in science-stopping ways. His theism did not impede his search for the natural principles and processes at work in nature which, he believed, only careful empirical research and rigorous reasoning could elucidate. Hutton’s theistic science was not unusual during the late-nineteenth century. As historian Matthew Stanley has shown, leading theistic scientists during the second half of the nineteenth century such as Michael Faraday, James Clerk Maxwell and Lord Kelvin did their science no differently than non-theists such as Huxley or John Tyndall. Both groups invoked natural laws and processes in scientific explanations. Theistic scientists were methodological but not metaphysical naturalists. The idea that theistic belief was a serious science-stopper has been considerably overstated. But if Hutton’s theism rarely if ever distorted his science, it did shape his views on evolution’s larger social, ethical and religious meanings and implications. Debating evolution with Dunedin’s Anglican bishop and its Presbyterian professor of divinity in 1876, for example, Hutton fleshed out some of those. Ancient peoples often fought and sometimes killed those outside their own family, community or nation. But Jesus taught that such ‘clanship’ was immoral. By revealing how much humans shared with animals, Hutton argued, evolution was now teaching us to extend our sympathies beyond the human race. Cruelty to animals was as wrong as it was to human beings. Agreeing with Darwin that humans and modern apes had evolved from a common ancestor, and that evolution by natural selection helped to explain the development of certain bodily, mental and moral characteristics, Hutton argued that psychic evolution represented a new and distinctive phase in human evolution. Competitive struggle and conflict between individuals and groups had no place in this higher stage. The focus now shifted to self-improvement, sympathy and compassion for others, altruism and doing ‘the Will of God.’ In his last book, The Lesson of Evolution (1902), Hutton argued that the ‘ultimate purpose of evolution cannot be fulfilled’ on earth but only in a ‘spiritual existence beyond the grave.’ These views, Hutton acknowledged, were somewhat speculative, but compatible with science. Many, probably most, leading men of science in colonial New Zealand took similar positions to Hutton on evolution and religion. German explorer and geologist Julius Haast, elected a Fellow of the Royal Society of London in 1865, considered the Origin the ‘great work of the age,’ he told the Philosophical Institute of Canterbury in 1862, because it explained how the ‘beautiful works of the Creator’ came to be. James Hector FRS, the most powerful government scientist in colonial New Zealand, expressed similar views on the few occasions he addressed evolution and religion. Ornithologist Walter Buller FRS, a Methodist turned Anglican, told the Wellington Philosophical Society in 1894 that he was both ‘a thorough disciple of Darwin’ and ‘a believer in the truths of revelation’ and ‘the spiritual destiny of man.’ Dunedin Presbyterian George Malcolm Thomson, an elder at Knox Church, criticized the ‘chilling effect’ on science of the ‘old dogmatic teaching’ on creation but, like his friend Hutton, saw evolution as God’s grand method of creation. Trained in biology at Oxford, A.P.W. Thomas became first professor of natural science at Auckland University College in 1883. A practising Anglican, Thomas told the Auckland public in 1904 that evolution conveyed a nobler idea of God’s creative work than fiat creation. Why did so many of the most influential scientists in colonial New Zealand interpret evolution theistically? Why did the antichristian scientific ideologies that burgeoned in Britain and Europe after Darwin— agnosticism, materialism, and pantheism—struggle to gain traction here? As my brief survey suggests, informal ties between New Zealand’s major Protestant churches—Anglican, Presbyterian and Methodist—and many of its leading men of science remained close and cordial throughout the nineteenth century. When the AAAS met in Christchurch in 1891, for example, members asked Hector, the president, to ask Bishop Nevill to publish the sermon he preached to the Association depicting evolution as God’s method of creation. Nevill agreed. Dunedin furnishes a particularly interesting example. T.J. Parker had arrived in the city in 1881 as professor of biology to succeed Hutton. Having worked as a demonstrator for T.H. Huxley in London, Parker called himself a ‘disciple’ of the ‘Master.’ The assertive and high-minded agnosticism Parker expressed in his inaugural lecture—he criticized anyone with reservations about evolution— annoyed even some liberal Presbyterian evolutionists. Yet Parker did not become a crusading agnostic like Huxley. Settling down to teaching and research, and speaking at city churches, he became a seatholder and parishioner at St Mathews Anglican church. In a colony that never had the kind of powerful Anglican scientific establishment that alienated Huxley and his colleagues, relations between the churches and the scientific community here remained more cordial, irenic and ecumenical. As James Hector told the AAAS in 1891, biology had flourished in New Zealand because university teachers such as Hutton, Parker and Thomas—evolutionists all—did not feel constrained by fear of religious controversy. Although several historians, including James Belich, have claimed that Newman’s paper typified the scientific racism and ruthless social Darwinism that burgeoned after 1859, they failed to investigate how men of science in the Wellington Philosophical Society responded to Newman’s claims. In fact, as they had in response to previous papers by Newman, several men of science attacked it on both empirical and moral grounds. 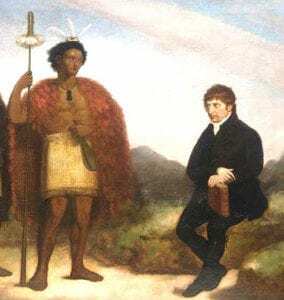 Dr Morgan Grace, an Irish-born Roman Catholic army surgeon trained in medicine in Germany and Scotland, argued that Newman had exaggerated Maori depopulation and predicted—correctly as it turned out—that the race, far from disappearing, would recover. James Hector, the leading government scientist of the period and a theistic evolutionist, rejected Newman’s arguments as factually flawed. He had seen plenty of large Maori families and healthy children in the King Country, said Hector. Newman had made a crude and unconvincing attempt to use science ‘to excuse ourselves.’ Hector condemned ‘A Study of the Causes’ as a spurious attempt to whitewash colonization. Chastened, Newman entered parliament in 1884, where he never expressed such views during an almost forty-year political career that included a term as Mayor of Wellington. Sometimes, I conclude, the theistic science of mainstream men of science made a difference.